Intended for use in gene therapy, artificial viruses efficiently carry genes and drug molecules into tumour cells Friday, 30 May 2008 Viruses are true experts at importing genetic material into the cells of an infected organism. This trait is now being exploited for gene therapy, in which genes are brought into the cells of a patient to treat genetic diseases or genetic defects. Korean researchers have now made an artificial virus. 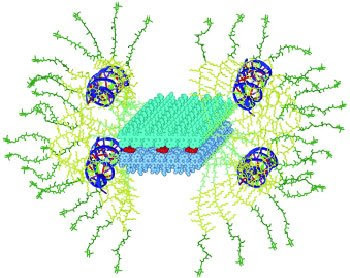 As described in the journal Angewandte Chemie, they have been able to use it to transport both genes and drugs into the interior of cancer cells. Natural viruses are extremely effective at transporting genes into cells for gene therapy; their disadvantage is that they can initiate an immune response or cause cancer. Artificial viruses do not have these side effects, but are not especially effective because their size and shape are very difficult to control — but crucial to their effectiveness. A research team headed by Myongsoo Lee has now developed a new strategy that allows the artificial viruses to maintain a defined form and size. The researchers started with a ribbon-like protein structure (â-sheet) as their template. The protein ribbons organized themselves into a defined threadlike double layer that sets the shape and size. Coupled to the outside are "protein arms" that bind short RNA helices and embed them. If this RNA is made complementary to a specific gene sequence, it can very specifically block the reading of this gene. Known as small interfering RNAs (siRNA), these sequences represent a promising approach to gene therapy. New evidence supports a 'systems' view – and gives a glimpse at how it works Wednesday, 21 May 2008 How does a stem cell decide what specialized identity to adopt – or simply to remain a stem cell? A new study suggests that the conventional view, which assumes that cells are “instructed” to progress along prescribed signalling pathways, is too simplistic. Instead, it supports the idea that cells differentiate through the collective behaviour of multiple genes in a network that ultimately leads to just a few endpoints – just as a marble on a hilltop can travel a nearly infinite number of downward paths, only to arrive in the same valley. The findings, published in the May 22 issue of Nature, give a glimpse into how that collective behaviour works, and show that cell populations maintain a built-in variability that nature can harness for change under the right conditions. The findings also help explain why the process of differentiating stem cells into specific lineages in the laboratory has been highly inefficient. Led by Sui Huang, MD, PhD, a Visiting Associate Professor in the Children’s Hospital Boston Vascular Biology Program (now also on the faculty of the University of Calgary), and Hannah Chang, an MD/PhD student in Children’s Vascular Biology Program, the researchers examined how blood stem cells “decide” to become white blood cell progenitors or red blood cell progenitors. They began by examining populations of seemingly identical blood stem cells, and found that a cell marker of “stemness,” a protein called Sca-1, was actually present in highly variable amounts from cell to cell – in fact, they found a 1,000-fold range. One might think that low Sca-1 cells are simply those cells that have spontaneously differentiated. However, when Huang and Chang divided the cells expressing low, medium and high levels of Sca-1 and cultured them, each descendent cell population recapitulated the same broad range of Sca-1 levels over nine days or more, regardless of what levels they started with. “We then asked, are these cells also biologically different?” says Huang, the paper’s senior author. “And it turned out they were dramatically different in differentiation.” Blood stem cells with low levels of Sca-1 differentiated into red blood cell progenitors seven times more often than cells high in Sca-1 when exposed to erythropoietin, a growth factor that promotes red blood cell production. Conversely, when stem cells were exposed to granulocyte–macrophage colony-stimulating factor, which stimulates white blood cell formation, those that were highest in Sca-1 were the most likely to become white cells. Yet, in both experiments, all three groups of cells retained characteristics of stem cells. Huang and Chang then looked at the proteins GATA1 and PU.1, transcription factors that normally favour differentiation into red and white blood cells, respectively. Blood stem cells that were low in Sca-1 (and most prone to become red blood cells) had much more GATA1 than did the high- and medium-Sca-1 cells. Stem cells high in Sca-1 (and least prone to become red blood cells) had the highest levels of PU.1. But most important, the differences in Sca-1, GATA1 and PU.1 levels across the three cell groups became less pronounced over time, as did the variability in the cells’ propensity to differentiate, suggesting that the differences are transient. In a final step, Huang and Chang used microarrays to look at the cells’ entire genome. Again, they found tremendous variability within the apparently uniform cell population: more than 3,900 genes were differentially expressed (turned “on” or “off”) between the low- and high-Sca-1 cells. And again, this variability was dynamic: the differences diminished over time, with gene activity in both the low- and high-Sca-1 cells becoming more like that in the middle group. Together, the findings make the case that a slow fluctuation or cycling of gene activity tends to maintain cells in a stable state, while also priming them to differentiate when conditions are right. “Even if cells are officially genetically identical and belong to the same clone, individual members of that population are quite different at any given time,” says Huang. “This heterogeneity has usually been seen as random ‘measurement noise,’ and, more recently, as ‘gene expression noise.’ But it turns out to be very important, and is the basis for stem cells’ multipotency – their ability to differentiate into multiple lineages.” “Nature has created an incredibly elegant and simple way of creating variability, and maintaining it at a steady level, enabling cells to respond to changes in their environment in a systematic, controlled way,” adds Chang, first author on the paper. Practically speaking, the work suggests that stem cell biologists may need to change their approach to differentiating stem cells in the laboratory for therapeutic applications. “So far the process has been highly inefficient – only 10 to 50 percent of cells respond to the hormone or whatever is given to make them differentiate,” Huang says. “That is because of the cells’ inherent heterogeneity. People have been finding more and more sophisticated stimulator cocktails, but we could make the process more efficient by harnessing the heterogeneity and identifying cells that are already highly poised to differentiate.” Chang has already done follow-up experiments showing that stem cell differentiation can be made dramatically more efficient by choosing the right subpopulation of stem cells and stimulating them promptly, while they are most apt to differentiate. “I’m not doing anything complicated – just using what nature already has,” she says. But the findings also challenge biologists to change how they think about biological processes. The work supports the idea of biological systems moving toward a stable “attractor state,” a concept borrowed from physics. In this case, blood stem cells tend to remain blood stem cells, yet they experience inherent fluctuations in gene activity and protein production that can sometimes be enough to tip the balance and cause them to fall into other attractor states – namely, red or white blood cell progenitors. Specific growth factors can tip the balance, but these factors are part of an overall landscape that guides cells toward different destinies. A marble going downhill will eventually end up in a valley, but which valley it falls into depends on the shape of the landscape. 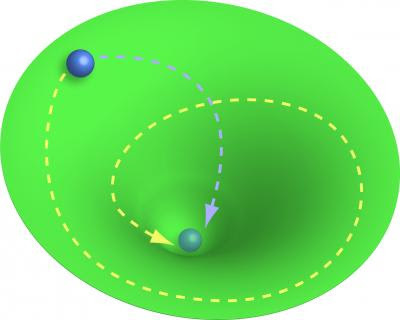 When exposed to a growth factor, a blood stem cell, represented by a blue marble, falls into a new "attractor state," depicted as a valley in a landscape, to become a red blood cell. Different influences, such as differentiation factors, can lead stem cells to the same attractor state, but each cell can take very different paths though the landscape to get there (just as a marble might take a different path each time it rolls down a hill). Credit: Children's Hospital Boston. Embryonic Pathway Induce Stem Cell Character Thursday, 15 May 2008 Studies of how cancer cells spread have led to a surprising discovery about the creation of cells with adult stem cell characteristics, offering potentially major implications for regenerative medicine and for cancer treatment. Some cancer cells acquire the ability to migrate through the body by re-activating biological programs that have lain dormant since the embryo stage, as the lab of Whitehead Member Robert Weinberg has helped to demonstrate in recent years. Now scientists in the Weinberg lab have shown that both normal and cancer cells that are induced to follow one of these pathways may gain properties of adult stem cells, including the ability to self-renew. 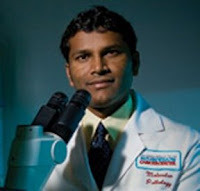 In a paper published online by Cell on May 15, former postdoctoral researcher Sendurai Mani and his colleagues demonstrated in mice and in human cells that cells that have undergone an “epithelial-to-mesenchymal” (EMT) transition acquire several important characteristics of stem cells. Conversely, the researchers also showed that naturally existing normal stem cells as well as tumour-seeding cancer stem cells show characteristics of the post-EMT cells, including the acquisition of mesenchymal cell traits, which are usually associated with connective tissue cells. Epithelial cells, which make up most of the human body, bind together in sheet-like structures. In embryonic development, the EMT process breaks up cell-cell adhesion in the epithelial layer, and converts epithelial cells into more loosely associated mesenchymal cells. In the context of cancer development, some cancer cells within a primary cancer may undergo an EMT, migrate through the body to their end destination, and there resume their epithelial form through a reverse process (the mesenchymal-to-epithelial transition). A. Normal human mammary epithelial cells are tightly packed in culture. B. The epithelial-mesenchymal transition (EMT) generates cells that are more loosely associated and offer some traits of adult stem cells. Mani and his colleagues have identified FOXC2, one of the key genes involved in invasion and metastasis. In addition, FOXC2 appears to program the metastatic ability of some breast cancers. Mani knew that during embryonic development, FOXC2 expression is restricted to mesoderm and mesoderm-derived cells when they are in an undifferentiated state, and its expression disappears once these cells differentiate. Similarly, his experiments showed that epithelial cells that undergo EMT express FOXC2, but that expression is lost when they revert back to an epithelial state. In collaboration with Andrea Richardson and Jeffery Kutok, pathologists at Boston’s Brigham and Women’s Hospital, Mani went on to study FOXC2 expression in normal human breast tissue. It turned out that such cells were located precisely where researchers expect to find mammary epithelial stem cells. As he pondered these findings and the earlier results about FOXC2’s role in metastasis, Mani wondered: Just what were these cells generated by EMT that expressed FOXC2" Were they simply fibroblasts, the most common cells in normal connective tissue? Or were they actually stem cells? “I asked Mai-Jing Liao, another postdoc in the Weinberg lab, to check whether the cells generated by EMT would have any stem cell properties,” recalls Mani, now an assistant professor in the department of molecular pathology at the University of Texas’s M. D. Anderson Cancer Center in Houston. “He said, ‘You must be out of your mind, but it won’t take more than half an hour to check.’” Much to Liao’s surprise, when he examined cells that had undergone an EMT, his tests did highlight surface proteins that are key markers for stem cells. The researchers found that the cells that underwent the EMT process were mesenchymal-like in appearance and demonstrated stem-cell surface markers. The cells also displayed an increased ability to grow in suspension, forming structures called mammospheres — another trait of mammary stem cells. Some cells in the resulting mammospheres showed, in turn, stem cell markers, indicating they could differentiate into two kinds of mammary cells. And cells in the mammospheres retained their stem cell properties even after the EMT induction process was stopped. Human mammary epithelial cells that undergo an epithelial-to-mesenchymal transition (EMT) in culture may grow in suspension into structures called mammospheres - a trait they share with mammary epithelial stem cells. Here, the yellow cells present surface proteins indicating that they can develop into more than one type of mammary cell. Credit: Wenjun Guo. Help China Earthquake victims! 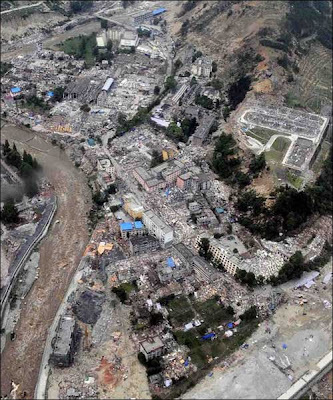 Thursday, 15 May 2008 More than 50,000 people may have died in the earthquake that devastated parts of China on Monday, Chinese state media say. The destruction is massive in the town of Yingxiu in Wenchuan County, Sichuan Province, where Xinhua news agency has reported 7,700 people have perished, near the earthquake's epicenter. In Spain, the Czech Republic, Sweden, Denmark, France and the Netherlands, the balance leans to a greater or lesser extent towards the side of medical benefits. Hence the majority agree with the statement that “the medical benefits for many human beings that can perhaps be obtained in the future thanks to research with embryos that are a few days old are much more important than the embryos' rights”. In Austria, Ireland, Germany, Poland, the United States, Japan and Israel, the balance inclines more or less (depending on the country) towards the rights of embryos: that is, a majority dissent from the idea that “the medical benefits for many human beings that can perhaps be obtained in the future thanks to research with embryos that are a few days old are much more important than the embryos' rights”. Researchers at Cornell University in New York have made a breakthrough in genetics by creating the first genetically modified (GM) human embryo. The GM embryo was produced to study how early cells in the embryo develop, but the scientists destroyed it just after five days. Led by Nikica Zaninovic, researchers at Cornell University used a virus to add a gene, a green fluorescent protein, to an embryo left over from assisted reproduction. It is believed to be the first documented genetic modification of a human embryo. Zaninovic's achievement was announced at the American Society for Reproductive Medicine annual meeting in 2007, but was only publicized recently when the United Kingdom's reproductive technology regulators reviewed the research. One of the authors of the study said to AP that the work was focused on stem cells. He noted that the researchers used an abnormal embryo that could never have developed into a baby anyway. "None of us wants to make designer babies," said Dr. Zev Rosenwaks, director of the Center for Reproductive Medicine and Infertility at New York-Presbyterian/Weill Cornell Medical Center. Dr. Rosenwaks said the research had been approved by a review board at his medical center and been privately financed, so it did not violate federal restrictions on research involving human embryos. Doctors already put foreign genes into people as part of gene therapy to treat diseases. But those genetic changes generally cannot be passed on to future generations because they are made to only certain types of cells in the body, like blood cells or muscle cells. Genetic changes made to an embryo would theoretically be heritable if the embryo became a baby. So far, this has been a no-go area for scientists and medical professionals. The breakthrough has brought with it major concerns. The British regulator, the Human Fertilisation and Embryology Authority (HFEA), has even cautioned that such controversial experiments may lead to "large ethical and public interest issues". However, the HFEA has said that it is preparing for scientists to apply for licences to create GM embryos. The House of Commons in Britain is about to consider legislation permitting this and other controversial reproductive technologies, such as the creation of chimeras – human-animal hybrid embryos. The first voting on this Bill took place yesterday in the British Parliament. There the MPs voted to allow, with a great majority, the plan to update the human embryology laws to continue to their next Parliamentary stage. The research raises a number of difficult ethical questions. Though adding a fluorescent protein was merely a proof-of-principle step, modified embryos could be used to research human diseases. Scientists say embryos wouldn't be allowed to develop for more than a few weeks, much less implanted in a woman and brought to term. If the embryos were allowed to develop, genetic modifications – which would be permanent and passed to future generations – might prevent disease. Modifications might also be used for other reasons – physical appearance, intellectual prowess and personality changes – though the necessary science remains hypothetical at this point. Developing such techniques would necessarily involve at this stage trial-and-error and risk-taking with human life. What do you think CellNEWS readers? Should genetically modified human embryos be used in research, or reproduction? Both? Neither? What would be the advantages or disadvantages? Would it OK to produce ‘designer babies’ in the future, when the technique is perfected? N. Zaninovic, J. Hao, J. Pareja, D. James, S. Rafii, Z. Rosenwaks. ASRM 2007 Annual Meeting, Poster session. The table above details the amount of funding (in US$) each applicant will receive from CIRM, the donor and institutional funds, the total building cost, the additional funds committed for faculty recruitment and other project costs, and total project costs. 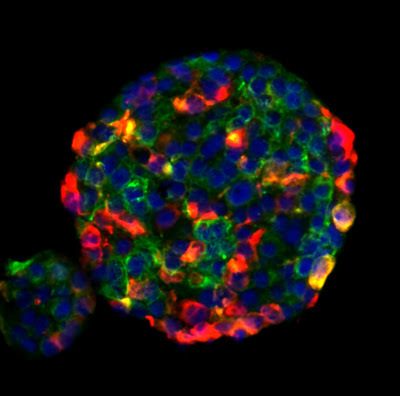 Funding new facilities – and encouraging investments by others in new facilities – that are free of any federal funding so as to allow research and development of therapies based on human embryonic stem cell (hESC) and other stem cell approaches to proceed in California without restrictions imposed by the federal government. Developing stem cell research centers that will expand research capacity and capabilities in California while bringing stem cell-related researchers together in a collaborative setting. Funding new facilities and improvements where research institutions have determined that existing facilities are inadequate or are lacking altogether and thus pose a challenge to the development of therapies and cures for diseases being addressed at these institutions. CIRM Institutes to carry out stem cell research in three categories: basic and discovery stem cell research, preclinical (translational) research, and preclinical development and clinical research. CIRM funding for these projects will be up to $50 million. CIRM Centers of Excellence to conduct stem cell research in any two of the three categories listed above. CIRM funding for these project will be up to $25 million. CIRM Special Program to conduct specialized stem cell projects in one of the categories listed above. CIRM funding for these project will be up to $10 million. CIRM Grants Awarded Since the Start: Since April 2006 when the CIRM awarded its first scientific grants under the California Stem Cell Research and Cures Initiative, the Institute has funded 168 grants totalling more than $530 million for investigator-initiated research grants and training to 22 California non-profit and academic institutions. The first grants directed $37.5 million for training 169 pre-doctoral, post-doctoral, and clinical fellows at 16 non-profit and academic research institutions. and today’s Major Facilities grants to 12 institutions totalling $271 million.